Not only are roof leaks annoying and inconvenient, but they can also be potentially dangerous. In fact, if a roof leak isn’t handled in a timely manner, it could lead to a number of serious problems such as mold growth, deck deterioration, and sometimes even an entirely comprised roof in need of a replacement. In order to avoid a major roof catastrophe, we recommend addressing all leaks straight away. Even a minor drip is a reason for concern since it could point to a much more serious underlying issue. Once a leak occurs, it’s vital to determine the cause, i.e. the source; however, that can sometimes be hard, especially for a non-expert. 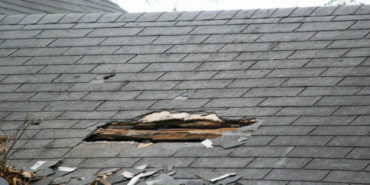 That is why it’s best to have a roofing specialist come over and diagnose the problem. Still, if you want to inspect your roof on your own first, there a couple of things you should pay attention to. Below, we’ve listed seven most common causes of leaks that could help you pinpoint the exact cause of your leaking roof. Checking if there are any missing or broken shingles is the first thing you should do if your roof is leaking. Also, it’s the easiest problem to spot. Since they are located on the exterior of the roof, shingles are easily identifiable. Strong winds and heavy rains can rip them from the roof, leaving exposed areas that could lead to leaks. Climb up a ladder and inspect every nook and cranny of your roof to look for missing shingles. 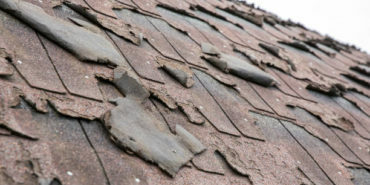 You might also find some shingle pieces around your house, especially after heavy storms. There are thin metal pieces (a.k.a. flashings) installed on the joints of the roof and under shingles, creating a water-resistant barrier and preventing leaks. Those pieces of metal are sealed together and can corrode over time. If that happens, the flashing becomes exposed to rain and wind that could make it crack. To check if your flashing is cracked, look for long runs of sheet metal under the shingles and on the joints. If you have concealed flashings, there will be a rubberized coating on top of them. Large cracks are a sure sign of a broken flashing. Roof leaks don’t have to point to a serious problem; in some cases, the cause is minor and easily fixable, such as a clogged gutter. If there are leaves, twigs, and other debris sticking out from your gutter, that might be the reason your roof is leaking. Also, if there is little or no water flowing through the gutters during a rainstorm, that might be another sign of clogged gutters. Cleaning a clogged gutter isn’t a difficult task, but it is a messy one. You can use a ladder and protective gloves to remove the clog and check if that’s why your roof has been leaking. 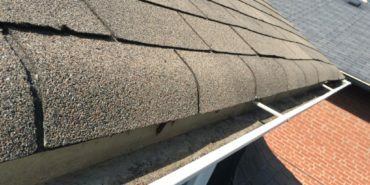 Many people neglect the overall condition and age of their roof although that can be the primary factor that causes leaks. Roofing materials are constantly exposed to all sorts of weather conditions, which eventually leads to wear and tear. Just like everything else, roofs age and deteriorate with time. It can be hard to determine the exact condition of your roof on your own, so we recommend hiring an expert who will check if your roof is within its life-expectancy. When there’s a huge opening on your roof, water can easily get in — and that’s exactly what a chimney is. However, if it is properly protected and professionally sealed, a chimney should be watertight. But if there are any cracks, that could be the cause of leaks. Moreover, if there are signs of damage along the mud cap, holes in the mortared joints, or signs of deterioration along the flashings where the chimney and the roof connect, you should probably have a roofing expert inspect the area. Fixing the chimney by yourself isn’t a good idea as its anatomy is complex and it requires professional handling. If there are signs of mildew or mold growth in your attic, or you can feel a strong, musty odor, chances are that the leak is coming from there. Since the attic is constantly between the outdoor and indoor temperatures that keep clashing when seasons change, condensation eventually forms and moisture follows. Examining your attic might be a good idea, especially if you detect the musty odor. Also, if black mold has formed, it’s best to call a professional, since it is highly toxic and dangerous. Once you treat the mold, consider attic ventilation; that will increase air circulation and prevent the problem from recurring. Skylights can make every home look brighter and more sophisticated; however, if improperly installed, they can cause a number of problems, including roof leaks. Generally speaking, skylights are very good at resisting leaks, but that can change over time, even if your skylight was properly installed. Luckily, this problem is easy to spot. If you notice water dripping from your skylight or you see water stains around the edges, inspect the skylight closely. You could easily fix a minor crack with a layer of silicone. However, if flashings need to be fixed or the entire skylight needs to be reinstalled, a professional should handle it. A leaking roof doesn’t have to be a huge problem; however, it can point to a more serious issue that cannot be spotted right away. For that reason, if you notice that your roof is leaking, don’t postpone fixing it. Addressing the issue as soon as possible is vital; that will prevent further damage and costly repairs. If your roof is old or damaged and it is giving you a headache, there’s no need to stress about it. We have taken it upon ourselves to take great care of both your roof and your home. You can always count on high-quality, reliable service with us — all of our employees are professionals who have undergone thorough background checks. Furthermore, we don’t use subcontractors and we have a lot of satisfied customers who have given our services five stars. If you need our professional help, don’t hesitate to give us a call at (904) 530-1446 or visit our contact page to get in touch. We will make sure that your roof is in the best condition and your home a safe place for you and your closest ones.